I haven’t updated this blog in a while. I took my time to (hand-) write a cook book for my daughter. I apologize to my readers and promise to frequently update this blog with new content. Having said that, last week I was at TechEd EMEA 2013 in Madrid as a staff member at the Windows Phone booth. Since I am very passionate about Windows Phone it was a great opportunity to talk to people from all over Europe about Windows Phones and some of the features in Windows Phone. There is. Simultaneously press the power button and the Windows button. The screenshot will automatically be saved into an album called “Screenshots” in your picture hub. You can pick the language, the region, the regional format for date and the Browser & search language. In order to apply those changes you have to restart your phone. – “Why do I get the error message ‘Attention required. Tap here’ when I try to download an app? Your phone might have temporarily lost its Internet connection, or you might be trying to download an app that’s too big to download over your phone’s cellular data connection. If you’re trying to download an app larger than 50 MB you need to connect to a Wifi network, or connect the phone to your computer and use the Zune software (only in case of Windows Phone 7.x devices). You will be prompted for Windows Live ID sign in the next time you perform a Windows Phone activity that requires Windows Live ID sign in, such as downloading apps or buying music and videos from Marketplace, or playing Xbox LIVE games. From this prompt, tap sign in to sign in with an existing Windows Live ID or create a new one. In order to change the Windows Live ID used to access features like Marketplace you need to reset your phone. This will erase will erase all your personal content, including apps that you purchased and downloaded, and will restore the factory settings. You may not be able to transfer purchased content to a different Windows Live ID. Other email accounts, including additional Windows Live accounts, can be removed or added without resetting your phone. The first Email address listed is the one you signed in to Windows Phone. First of all there are no ‘bad’ Windows Phones. Even so called low end devices like the Nokia Lumia 520 or the HTC 8S are smooth running Windows Phones with all features. You even can expand the 8 GB storage with a Micro SD storage card. The only thing that you don’t have with these Phones is NFC and a front face camera. If you are looking for a first phone for your child, those devices are a great choice. The Nokia Lumia 925: This is the Ferrari amongst the Windows Phones. It has it all: NFC, 8.7 MP back camera, 1.2 MP front camera, 16 GB storage (not expandable), a CPU speed of 1.5 GHz, 1 GB RAM and with a beautiful 4.5” screen just like the Nokia Lumia 920. It is thinner than the 920 though and looks very elegant. However, for my small hands that would be a little too big. I never really was a Ferrari kind of person, always have been an Audi person. That’s why my real favourite is the Nokia Lumia 720: The specs are: NFC, 6.7 MP back camera, 1.3 MP front camera, 8 GB storage (expandable with Micro SD card), CPU 1.0 GHz, 512 MB RAM and a 4.3” screen. These were some of the most frequent asked questions at TechEd last week. I enjoyed talking to people and sharing my passion about Windows Phone with people from all over Europe. I am looking forward to TechEd next year and I hope I can be part of it again. Many of my readers already followed my blog on http://andreahaubner.blog.com. Unfortunately in the last few weeks that site was unreachable, so I decided to move that blog. I started with rewriting all previous post, before there will be new content. When I started that blog I didn’t know anything about let’s say computer – related stuff. 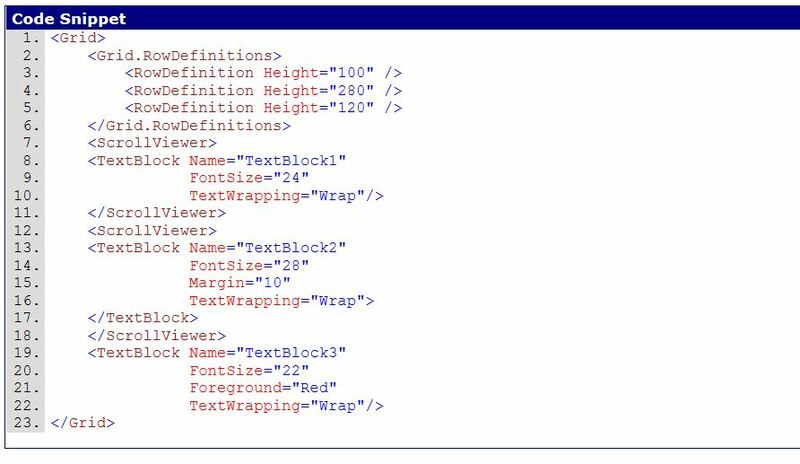 I didn’t know C#, I didn’t know Silverlight, I did not even know how to properly set up a blog. In other words: I knew nothing. So I picked the first suggestion for a blog that I could find. And to be honest, I did like the fact, that it said “blog.com”. I found that kind of appropriate. There were people telling me, that I picked the wrong site for my blog, but since I wanted to do that all on my own (that blog was my baby) I did not listen to them. Well, I better should have! Because my blog has been down so many times. I could not reach it, I could not update it… Nothing! Alone in the last 4 weeks, I was able to reach it once, and today. So I decided to move my blog. Every entry I made there, will be here as well. And soon there will be new content. I am currently working on another Windows Phone Application, where I needed a way to show the user that they had successfully performed a task and therefore unlocked another feature inside the application. First idea was adding some sound, but somehow I was not happy with that. So I thought, why not let the phone vibrate? It’s actually not that hard. The Windows Phone 7 SDK allows me to control the vibrate function easily. In the namespace Microsoft.Devices there is a class defined with the name ‘VibrateController’. When the user clicks the particular button, the phone vibrates. 1. the shortest vibration / pause is 0.1 seconds. 2. the longest is 5 seconds, but that is not recommended. 3. 3 vibrations in one sequence are enough. 4. 0.2 / 0.3 are good choices for an alert. Here you can find more information about the VibrateController Class. I don’t have a kitchen timer, but who cares? I have a Windows Phone, right? So I just created a little Alarm application to compensate for missing kitchen equipment. “ScheduledActionService.Add(alarm)” will let the alarm go off when the application has been closed. It will execute in the background. Works as expected. 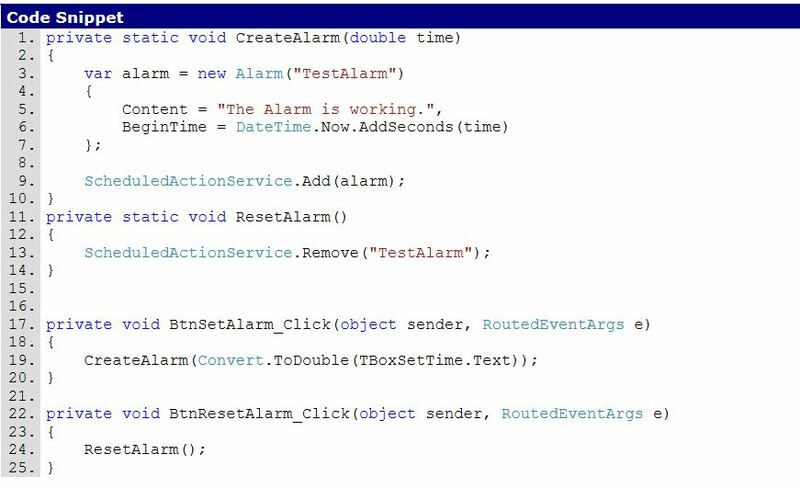 I just have to make sure to press the ‘Reset Alarm’ Button after an alarm went off, to prevent it from crashing. I am sure there is room for improvement, but for now, I am happy with that. I am currently working on yet another application. In that application I have two pages, the MainPage where I can choose a certain phrase. Choosing one of them navigates me to my second page, where I have three TextBlocks. The length of the text varies, depending on the phrase I chose in the first page. Well, what sounded nice in theory did not work out. When I ran the application, I could see there is a ScrollViewer, but somehow it just bounced back to the start point whenever I tried to scroll. Now I can scroll in the two TextBlocks that I need. “You limited the textbox height, but you wanted to limit the view of it. So you could also set the height on the scrollviewer, and remove it (so it will be auto) on the textblocks. 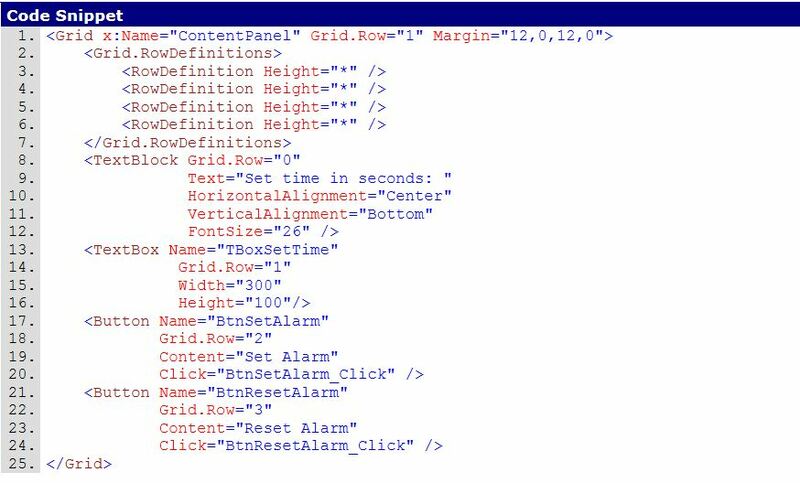 Let’s you still use the stackpanel. Many applications have an AppBar. 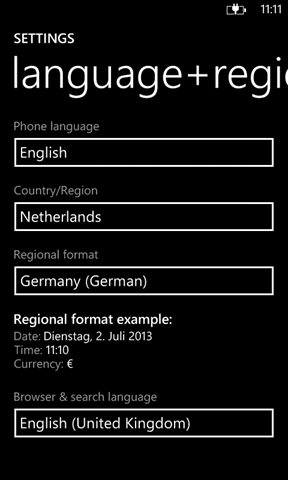 The ApplicationBar on Windows Phone is the equivalent of a menu bar and / or toolbar for desktop applications. It can include IconButtons and MenuItems. 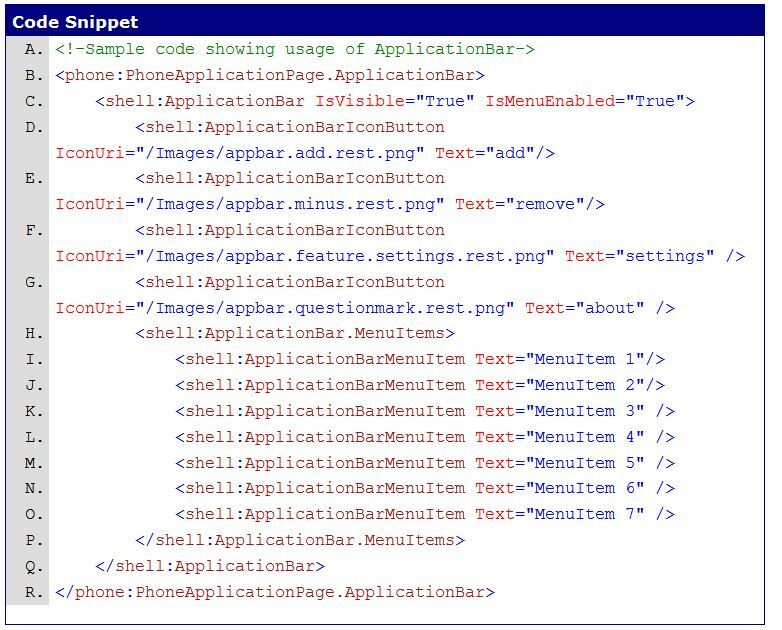 The namespace Microsoft.Phone.Shell defines the AppBar. I’ll get started right away with a new project in Visual Studio. 1. Create a folder (I usually call that folder “Images”) in my solution that is going to hold my icons. I select the icons and drag them into my created Images folder. 3. In the solution explorer I set the Build Action for all four of them to “Content”. 4. Reference them in my ApplicationBar. 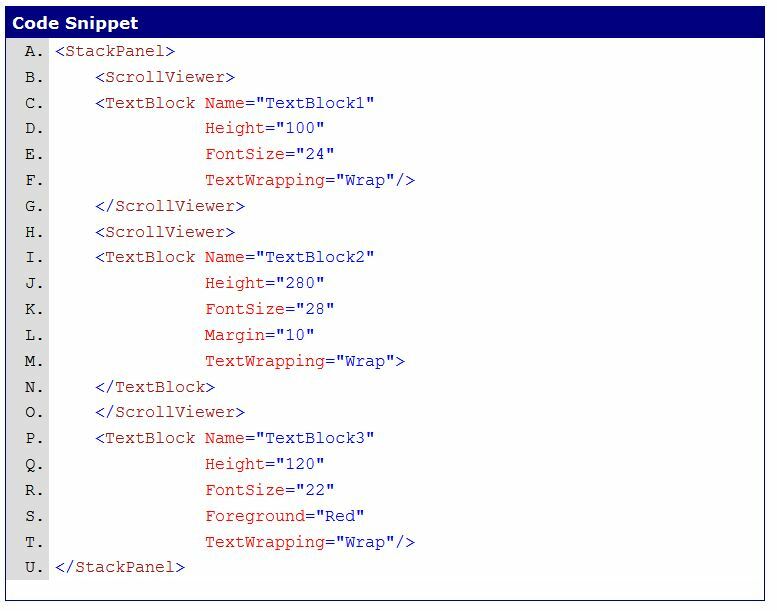 Visual Studio creates an AppBar by default. It is commented out. With Expression Blend I don’t have to do all this, because of the better UX (User eXperience) when creating an ApplicationBar. 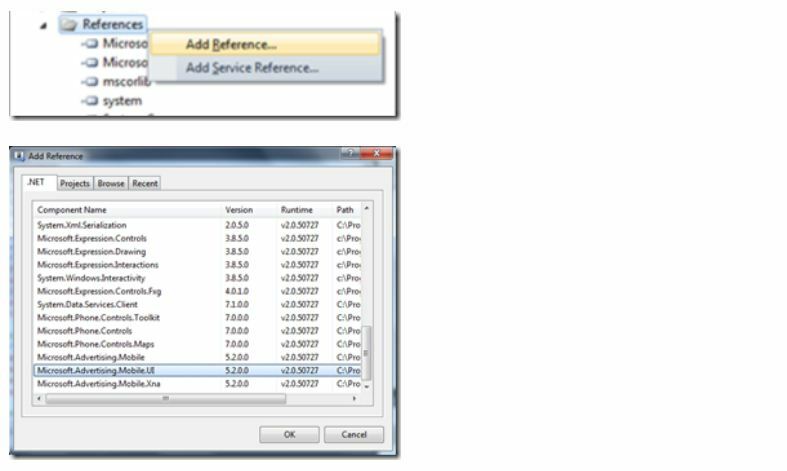 In the ‘Object and Timeline’ panel right-click the ‘PhoneApplicationPage’ and click “Add ApplicationBar”. That already created the ApplicationBar. Now I only need to add the icon buttons and the menu items. 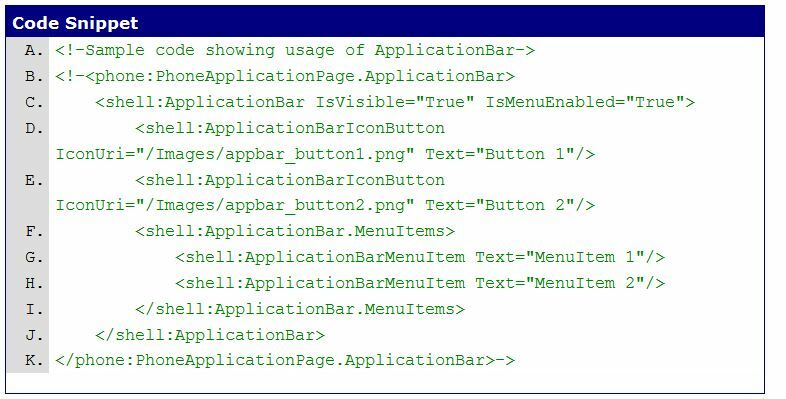 I right-click on the ApplicationBar to add ApplicationBarIconButton and ApplicationBarMenuItem. Clicking that little arrow opens a drop-down list where I can select the icon I want. I do that for all four buttons. To wrap it up: The ApplicationBar can have up to four IconButtons and as many MenuItems as I like. That is true for both Visual Studio and Expression Blend. 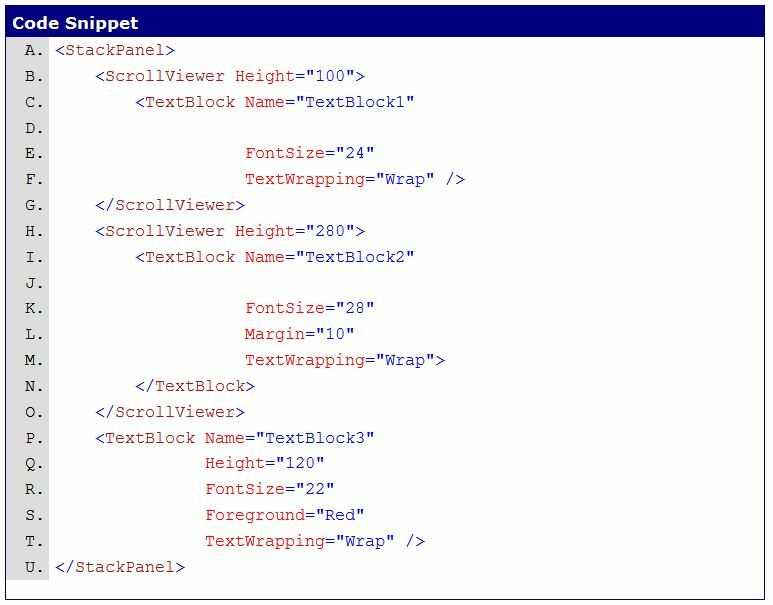 No matter where I create my AppBar, in Visual Studio or Expression Blend, the end result is the same. 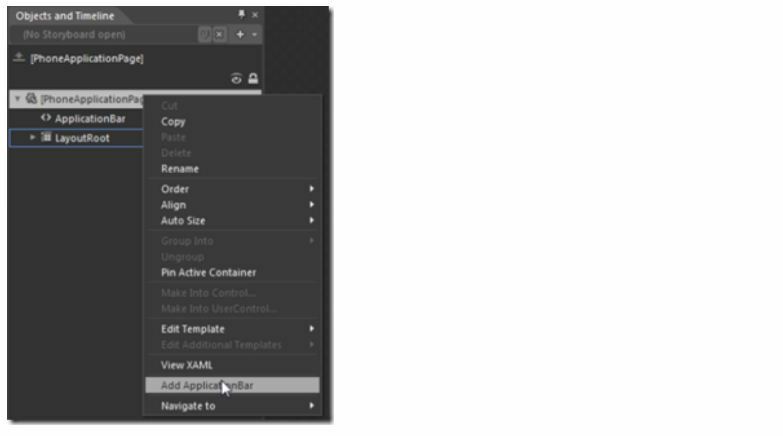 It looks easier to create an ApplicationBar in ExpressionBlend. But in the end it comes down to personal taste.